A deftly crafted biography of the author of Siddhartha, whose critique of consumer culture continues to inspire millions of readers. Against the horrors of Nazi dictatorship and widespread disillusionment with the forces of mass culture and consumerism, Hermann Hesse's stories inspired nonconformity and a yearning for universal values. Few today would doubt Hesse's artistry or his importance to millions of devoted readers. But just who was the author of Siddhartha, Steppenwolf, and Demian? Gunnar Decker weaves together previously unavailable sources to offer a unique interpretation of the life and work of Hermann Hesse. Drawing on recently discovered correspondence between Hesse and his psychoanalyst Josef Lang, Decker shows how Hesse reversed the traditional roles of therapist and client, and rethinks the relationship between Hesse's novels and Jungian psychoanalysis. 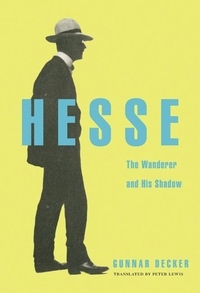 He also explores Hesse's correspondence with Stefan Zweig--recently unearthed--to find the source of Hesse's profound sense of alienation from his contemporaries. Decker's biography brings to life this icon of spiritual searching and disenchantment who galvanized the counterculture in the 1960s and feels newly relevant today.